Check the following Cisco Transceiver Modules for Compatible Cisco Switches Series: 95–500, 2960-L, 2960-CX, 3560-CX, 2960-X, 3650 and 3850. * Cisco 200/300/500 Series are still for sale and not officially end of life. Cisco 95/110 Series Unmanaged Switches: Get highly affordable Gigabit, Fast Ethernet, and PoE. No setup is required for QoS, network diagnostics, power-saving mode, and loop detection. Cisco 220 Series Smart Plus Switches: Get the powerful features, security, and performance of a managed switch with the affordability that’s closer to smart switches. Cisco 250 Series Smart Switches: Entry-level managed switch features and easy management at a great price. Build a business-class network with the features you need. 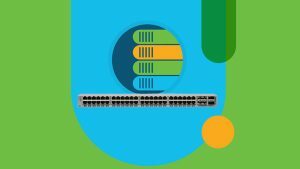 Cisco 350 Series Managed Switches: The ideal combination of affordability and advanced network features for small business, these easy to use fully managed switches are the corner stone of your network. Cisco 350X Series Stackable Managed Switches: Our managed switches deliver an ideal combination of affordability and advanced features with 10-Gigabit Ethernet and stacking. *1 LAN Base models only. *2 Mini models only. 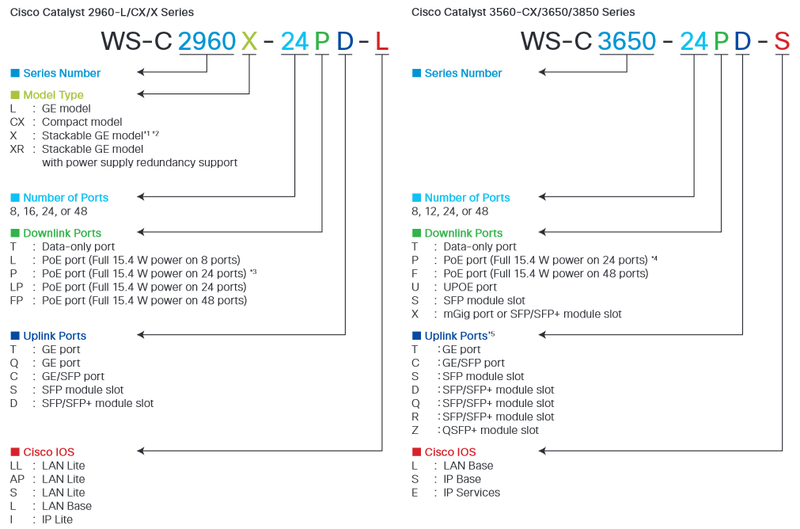 The SKU of each Cisco Switch contains a broad description of the product’s specification. *1 The LAN Lite model does not support stacking. *2 WS-C2960X-24PSQ-L does not support stacking. *3 Compact switches support full 15.4 W power on 8 ports. *4 Compact switches support full 15.4 W power on 8 or 12 ports. *5 The Network Module is required for the Cisco Catalyst 3850 Series (Except for 48-port fiber mode). The bracketed notations are abbreviations used in the specification comparison tables in this catalog. A dual-purpose port is an interface combining a Gigabit Ethernet port with an SFP module slot and is notated as GE/SFP (Either one can be activated independently). Similarly, SFP+ module slots are notated as SFP/SFP+ due to their compatibility with SFP. SFP/SFP+ modules can be mounted to QSFP+ module slots using an appropriate converter. In most cases, the supported port interfaces and number of ports of each product can be determined from their SKU.